Seven years ago this month, beginning on March 19, 2011, the United States Pentagon and NATO began a massive bombing campaign against the North African state of Libya. Even though Libya under the Jamahiriya had modified its stance on a number of issues related to its dealing with the U.S. and other imperialist states, the West wanted to overthrow the government to seize its oil fields and foreign reserves amounting to well over $160 billion. A pretext of impending genocide against western-funded rebels whom had sought to remove the Gaddafi government was utilized to justify a war of regime-change. 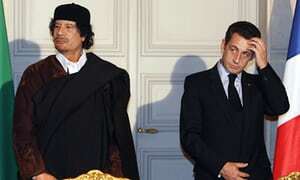 This crisis extends beyond the legal issues facing Sarkozy. Moreover, it is a problem of modern-day imperialism which is seeking new avenues of conquest for purposes of exploitation and profit-making. France is a leading capitalist state yet it is in perpetual economic stagnation. Joblessness remains high while a burgeoning population of African, Middle Eastern and Asian immigrants is fueling racial hatred. Notions of egalitarianism and bourgeois democracy must be selectively implemented so that the white ruling class maintains it power at the expense of a darker and growing minority seeking civil and human rights. Abroad France still maintains its interests throughout Africa and other parts of the world. Paris is in fierce competition with London and Washington for its status within the imperialist matrix related to the control of oil, strategic minerals and essential trade routes. Therefore on the seventh anniversary of the imperialist war against Libya, the need for unity among AU member-states is more important in this period than ever before. African economic growth, development and integration cannot however be looked at separately from the indispensable need for independent security structures to safeguard resources and the sovereignty of the people. The war against Libya represented the first full-blown campaign of the U.S. Africa Command (AFRICOM) which was established under the administration of President George W. Bush in 2008. AFRICOM was strengthened and enhanced under Bush’s successor President Barack Obama. Three African states, Gabon, Nigeria and South Africa, voting in favor of the UNSC Resolution 1973 was the worse error of the post-independence period. Although the AU sought to bring about a ceasefire after the bombs began to fall, it was to no avail. This proves conclusively that imperialism should never be trusted and peace and security in Africa can only be won with its destruction. Many Africans both on the continent and in the Diaspora felt that since Obama was a partial descendant of its people that he would develop a more favorable policy towards the continent and Black people inside the U.S. This was a gross miscalculation because the social and economic conditions worsened for Africans all over the world under his leadership on behalf of the imperialist world. Consequently, it is not the individual which shapes domestic and foreign policy. Imperialism is an exploitative system which arose from the exigencies of slavery and colonialism. In the modern period neo-colonialism is the last stage of imperialism which Dr. Kwame Nkrumah documented as early as 1965, a prediction which cost him his presidency in the First Republic of Ghana at the aegis of Washington, serving as a major setback for the African Revolution as a whole. Abayomi Azikiwe is editor of Pan-African News Wire. He is also a frequent contributor to Global Research.